It is with great hesitation that I discuss treatment of snuffles (Pasteurella Multocida) because in the vast majority of cases, rabbits with snuffles should be culled from your herd, i.e. killed. 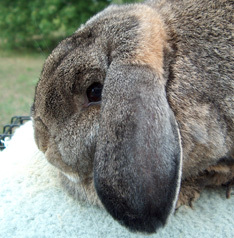 If you are a producer of rabbits only, and do not show rabbits, it is absolutely essential that you kill all rabbits with snuffles, regardless of how valuable they are, because meat producers raise such a large number of animals that one animal removed from the breeding program has very little effect relative to the damage it can do by spreading the disease. It gets him away from all your other rabbits. The superb ventilation outside will greatly assist in driving the symptoms away. It may be all he needs. Once outside, start antibiotic therapy. I prefer using penicillin in the form “Procaine Penicillin G”, available at all farm supply stores. There will not be a dosage for rabbits on the bottle. It must be given intramuscularly at a dosage of 30,000 International Units (IU) per kilogram of bodyweight, twice daily. It is important to weigh the rabbit so you know his exact weight, and calculate the dose exactly. Other antibiotics that are used include Penicillin-Streptomycin (“Pen-Strep”), Tetracycline, and Oxytetracycline. I prefer Penicillin because it is bactericidal. In other words, it kills any Pasteurella Multocida bacteria it comes in contact with. Tetracycline and Oxytetracycline, on the other hand, are bacteriostatic. They just stop the bacteria from multiplying and further increasing their numbers, in the hope that the animal’s immune system will be able to destroy them itself. Once treatment with these drugs stops, the Pasteurella remaining start multiplying again, and problems may soon reoccur. A word of caution must be given about the use of Penicillin. 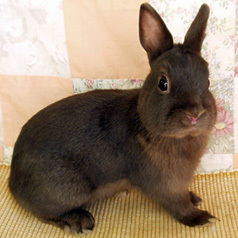 There are many reports in the veterinary literature of adverse reactions in rabbits to Penicillin and pen-strep. These include diarrhea and/or colitis (inflammation of the cecum), possibly resulting in death. I have never seen such a drug reaction, and it does not discourage me from using Penicillin in rabbits. The advantages outweigh the disadvantages in my mind. However, animals being given Penicillin or pen-strep should be closely monitored for signs of diarrhea. If they occur, the drub should be discontinued immediately, and the rabbit should be kept warm and given oral electrolytes. Doses for these other drugs are: Oxytetracycline - 5 mg/kg body weight intramuscularly twice daily for ten days. Tetracycline - 50 to 100 mg/kg body weight of powder in the drinking water daily for 10 days. It is important to restrict the water available to the rabbit for the first part of each day so he drinks the entire medicated dose each day. If you fill his water bottle/dish and then put in the daily dose, and he only drinks half the water, then obviously he is only getting half the dose of antibiotic he should be. For all these drug doses mentioned, THE CONCENTRATION OF THE DRUG IS ALWAYS ON THE BOTTLE OR PACKAGE. Again let me stress, you are furthest ahead to kill rabbits with snuffles. 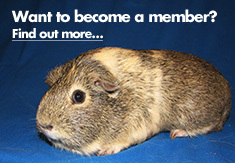 Only the one or two most valuable rabbits in your rabbitry should ever be considered for antibiotic treatment. The great problem with antibiotic treatment is that it often relieves the symptoms temporarily, until the rabbit is stressed again. The signs then reappear. Sometimes the signs never reappear. But, the rabbit will still have a Pasteurella Multocida infection sub-clinically, and will be spreading the bacteria to all your other rabbits without you being aware of it. If it is a doe, her next litter may all come down with snuffles even though she remains healthy.